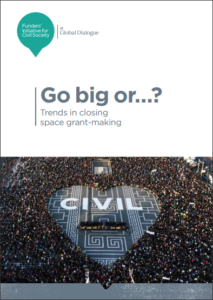 The Funders’ Initiative for Civil Society (FICS) released a new report called ‘Go big or…? 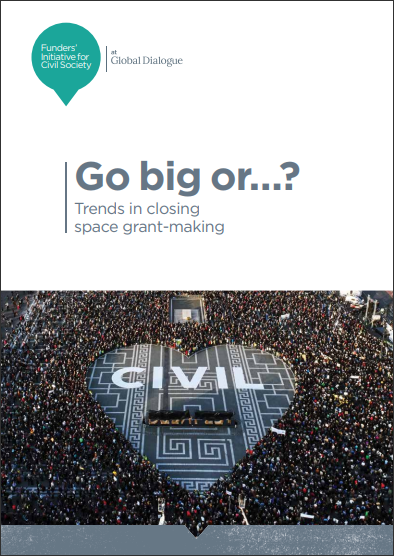 Trends in closing space grant-making’ that discusses relevant big pictures, changes, trends, and opportunities regarding the issue of closing space in civil society. This is one component of the FICS ‘three-year strategy to move beyond diagnosing the problem and coordinate a robust philanthropic response’. In the executive summary, ‘This paper brings together desk research and in-depth interviews to take stock of our sector’s response to this closing space. We look at how funders are supporting civil society to thrive in spite of attacks, what the barriers are to more concrete action, and how, as a sector, we can help to sow the seeds for a more enabling environment for civil society.’ Five points for each core concept – the big picture, changes, trends, and opportunities – are also introduced, to be expanded upon throughout the entire report.